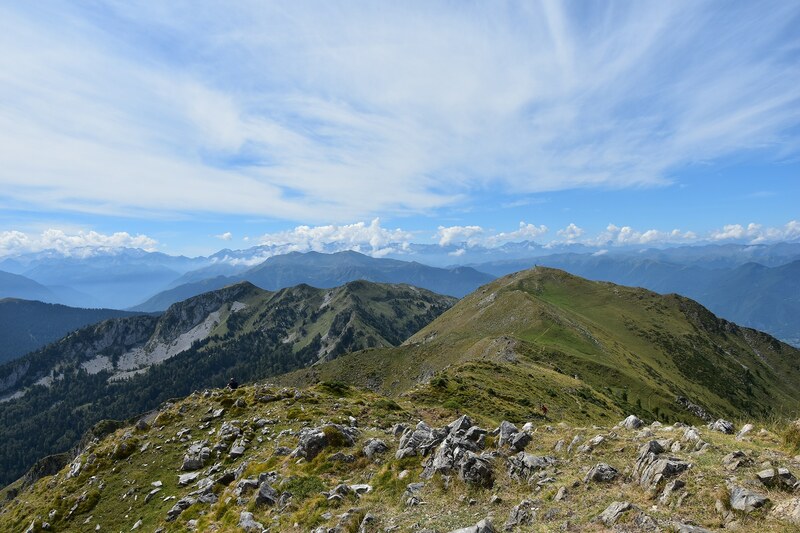 Hiking the Cagire Loop takes you on a beautiful ridge walk with views over the highest peaks of the Pyrenees. This fantastic hike is a bit challenging in places, taking in four peaks, and is best done anticlockwise. You can also shorten the walk to avoid the most challenging part if necessary. The starting point is at the Col de Menté, which is well signposted from the N125 at St-Béat. You can also get there from Aspet. You know you’re there when you see a sign showing "Col de Menté". Park near the Gite / Auberge La Soulan right at the Col. 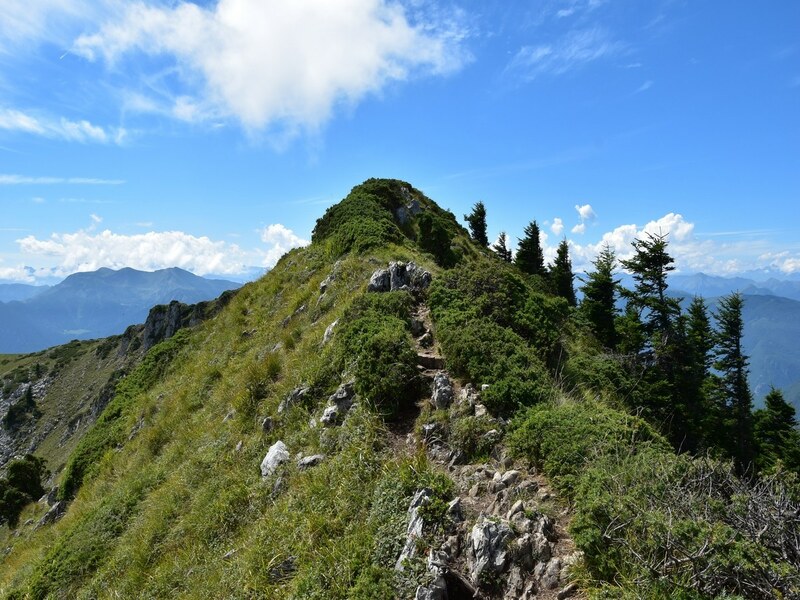 The Cagire Loop is a wonderful ridge walk, getting you up and over four peaks along the way. This is truly a wonderful day out walking in the Pyrenees! To start, find parking near the Gite / Auberge La Soulan at the Col de Menté (1349m). This is a famous col from the Tour de France, so in summer make sure the Tour isn’t crossing this road! Cross the main road to admire the wooden animal sculptures in front of the house. From there, pick the forest track to the right (the one with a barrier). This wide track gently runs downhill along the slope through the forest. 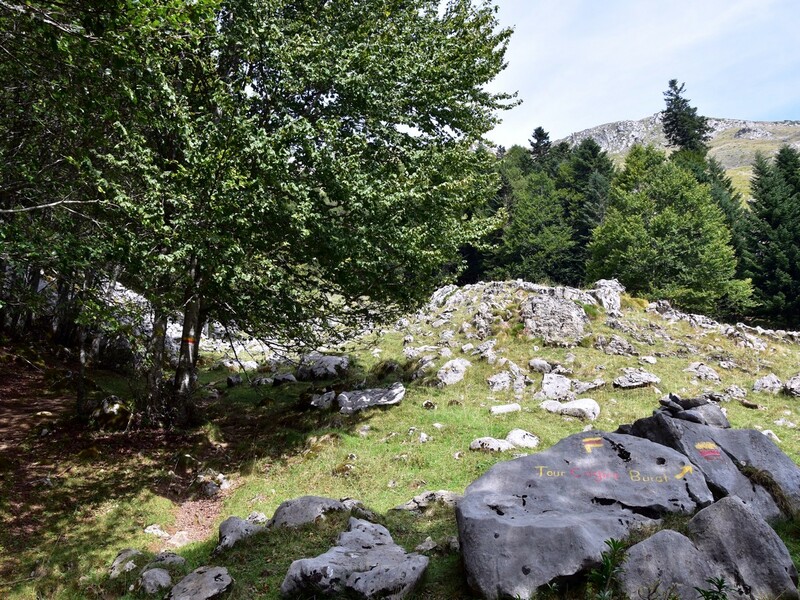 Follow this track down for about 1.6km to reach a cairn with a red and yellow cross painted on a big stone. Here, veer left up the path through the forest. There is a short pull-up before the path goes down again to meet another forest track. At this track, turn left and follow the track up for another 1.5km until you reach the Refuge and Cabane de Larreix (1470m). Leave the track taking a right turn beneath the refuge (main building) and then take the left between the two buildings. There is a lovely fountain where fresh spring water can usually be collected (it may be dry at the end of the season though), and a picnic table is there as well. From the refuge, take the signposted / marked trail which heads left into some woodland after the fountain. In the distance to the north in front of you stands the ridge you are aiming at. Follow this track for a few minutes until you see a big red and yellow marking on a large stone. It shows “Tour Cagire-Burat” to the right. Follow this path to the right, passing through a line of fir trees before it narrows and starts rising steeply along the grassy slope. Depending on the season, check for the lovely flowers which can be admired along the way, from bright yellow daffodils to deep blue gentians or mauve colchicums. After a short while, the going eases up and the views open significantly, with the beautiful cliffs of the Pic de l’Escalette rising steeply over the refuge and Cabane de Larreix behind you. To the east you’ll see the vista opening to the Pyrénées Ariégeoises, and la Maladeta to the south. Stay on the trail above the forest, following a NE bearing. You will soon notice a gully to your left with a small line of scree. Spot the red and yellow markings, one with arrows on a big rock just right of the scree, and one on a small clump of beech trees further to the right. Head straight up between the two, aiming at another marking on a lone fir tree slightly to the right. Pick the small path to the right of that fir tree and follow it up as it passes a few metres away from a promontory at roughly 1650m. There are amazing views from here. Continue on the marked trail, still in a NE direction, aiming at a shoulder, which is known as the Col de Coume Ossan.  During this whole part of the ascent, make sure you stick to the red and yellow markings which can be found at regular intervals, mainly on lone fir trees. Right after a small cluster of fir trees, you will reach the top of the shoulder and will enjoy nice views to the north. From the Col, the marked trail makes a sharp turn, veering right (west), then slightly left (WNW). The trail gets a bit more obvious, with the markings now on rocks only. 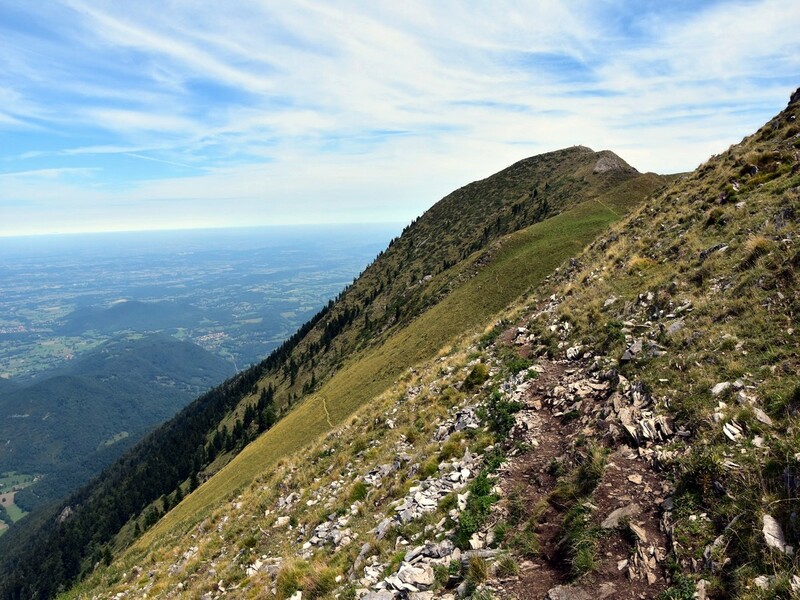 Follow the trail as it rises gently, contouring a small rocky outcrop to reach the upper part of the gully which rises up to an unnamed col at 1847m between the Pic de Cagire (1912m) and Sommet de Pique-Poque (1898m). A wooden signpost shows directions at the col, where an amazing vista opens up to the NW. Once on the ridge, take the trail to your right. This is one of the easiest parts of the hike, as the going is very gentle. 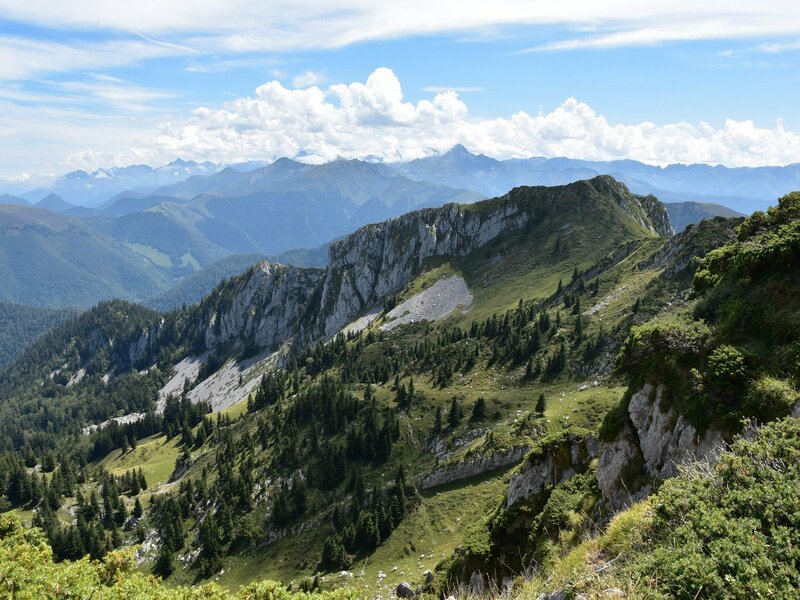 Try not to be too distracted by the views as you go, though, and about 170m from the col, just stop and take a look at the tiny grotto to the right of the trail, something most of the walkers never see as they are focused on the mighty views to their left!! Just before the summit, the marked trail passes only a few metres away from a deep sinkhole, which is well signposted, with a “Danger” sign and ropes. One last short pull-up and you will reach the summit of the Pic de Cagire, at 1912m, which offers one of the best vistas of the Northern Pyrenees. To the north, the extensive views over the lowlands are testimony of the remarkable prominence of this summit. While to the west, lines and lines of mighty peaks and ridges can be admired, as far as the Pic du Midi de Bigorre, the main peaks of the Massif du Néouvielle and the knife-edged ridge of the Cirque de Troumouse some 50-60 km away. 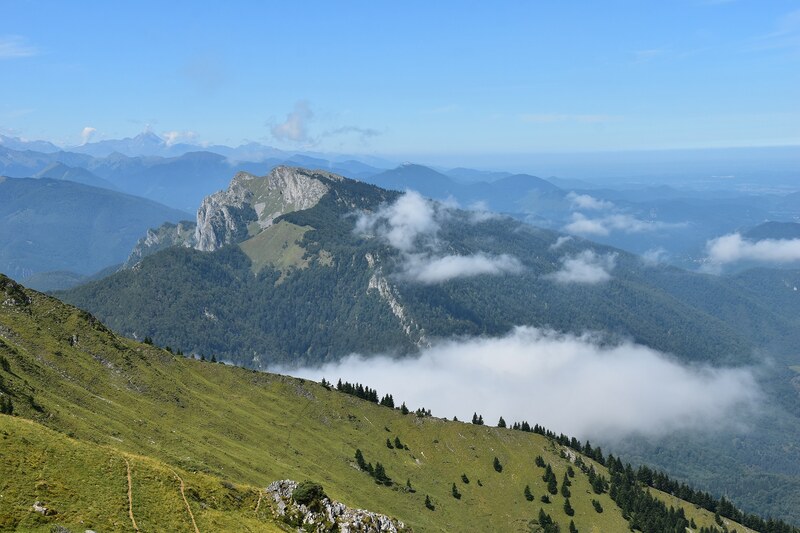 To the E/SE, most of the highest peaks of Haute-Ariège can be seen. But the most amazing part is the views S towards the massifs of Posets / Perdiguère and la Maladeta and its glaciers, with the Pico de Aneto (highpoint of the Pyrenees at 3,404m) looking very close, although it is about 36km away!! Take the time to venture to the cross below the summit before retracing your steps back along the ridge to the unnamed col. From the unnamed col, head south on the ridge, following the red and yellow markings, which soon leave the main trail as they head (left) straight to the Sommet de Pique-Poque (1898m), where the views to the south are even more stunning. The bulky shape of the Pic du Gar-Pic Saillant ensemble to your right will also probably catch your eye. 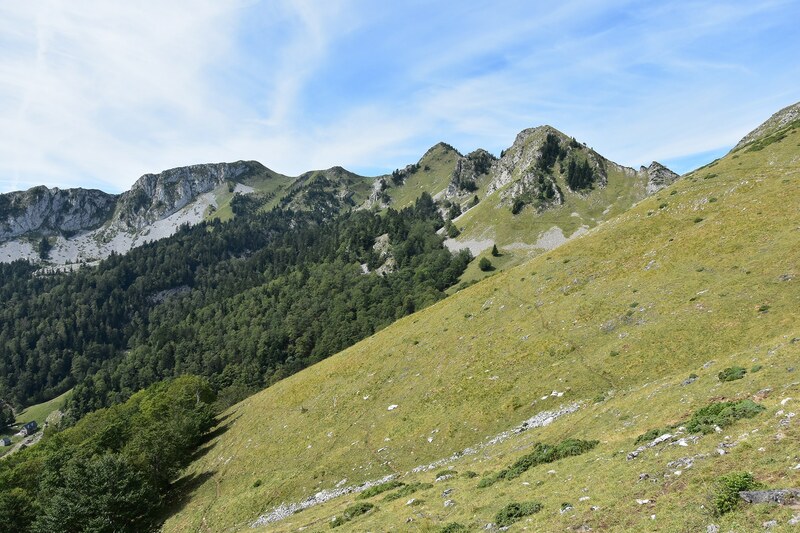 Keep heading south on the trail, which will lead you to the Col du Pas de l’Ane (1708m). In front of you stands the Crête des Parets, a fine ridge with steep slopes. 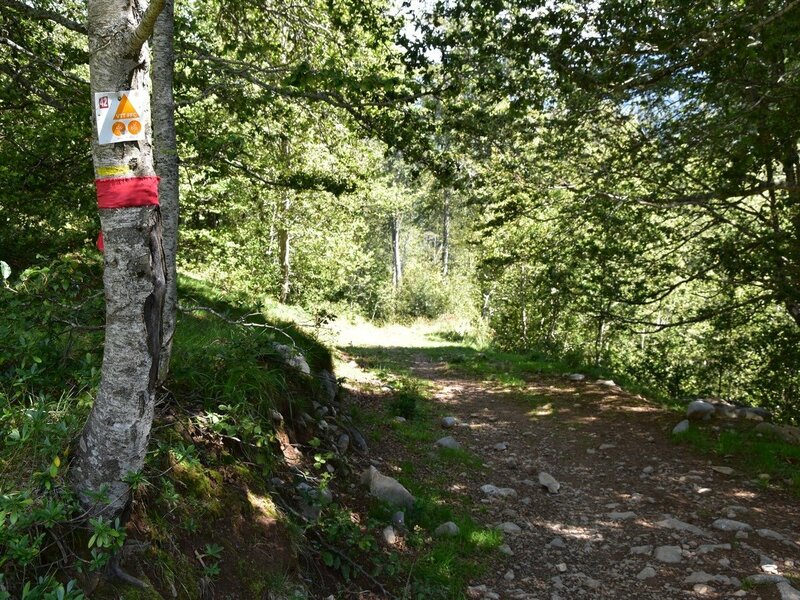 From here, those who want an easier or quicker way back can take the path heading down to the left and follow the marked trail down which will lead you in 20/30 minutes to the Cabane de Larreix. From there you can retrace your way to the car. If you like a bit of fun, with a touch of (very) easy scrambling and a slightly airy part, keep on the small path right in front of you. It has both yellow and red markings but offers a bit of adventure as it winds its way up and down along the ridge before climbing up more steeply along the ridgeline. This section will require a bit of attention, as the path is narrow and a bit slippery in parts. The use of hands is required on a few occasions. 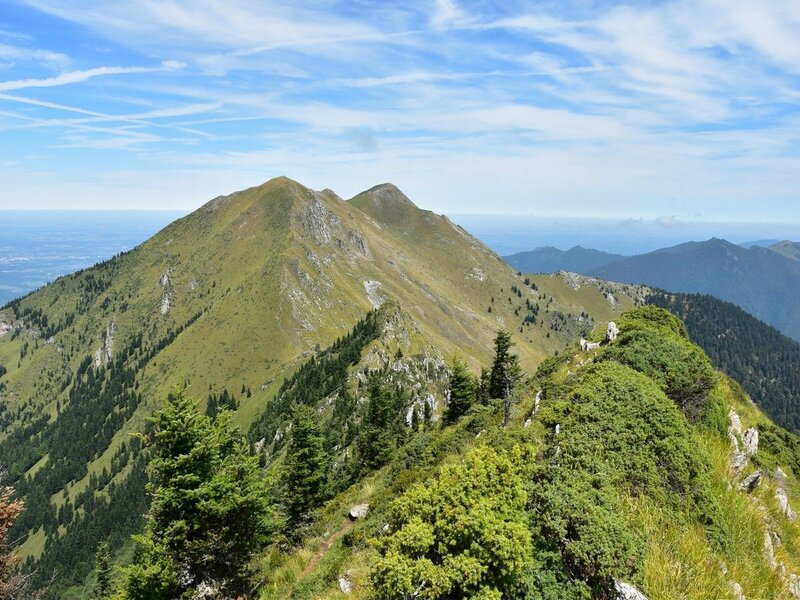 At some point, it reaches the ridgeline and gives a real impression of airy wildness, but as long as you have a bit of a head for heights, this will be no problem for you and you will fully enjoy it! 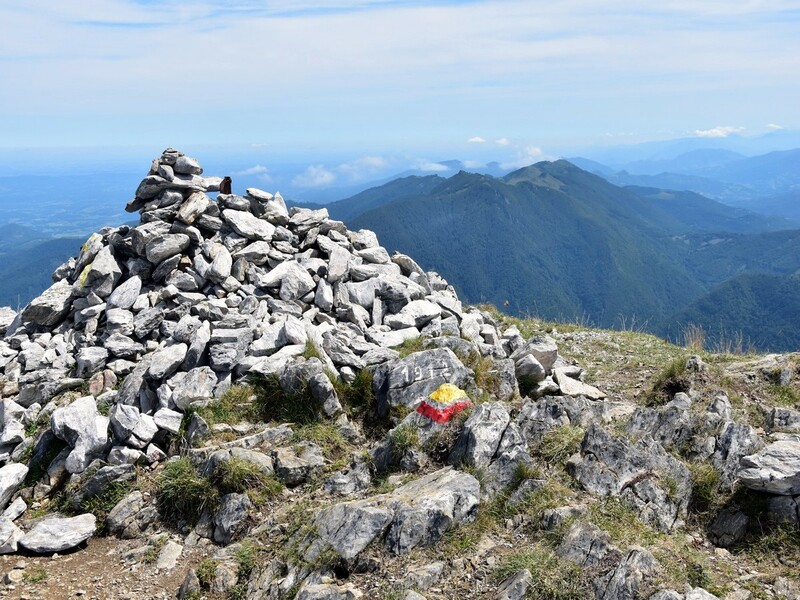 As you reach the highpoint at the Sommet des Parets (1869m), the beautiful views to the south opens again, but do not forget to take a look back at the way you came as well. The going from now gets much easier, and it is a gentle stroll along the obvious trail which heads S then SE, passing over a minor top before dropping down to a col at roughly 1810m. 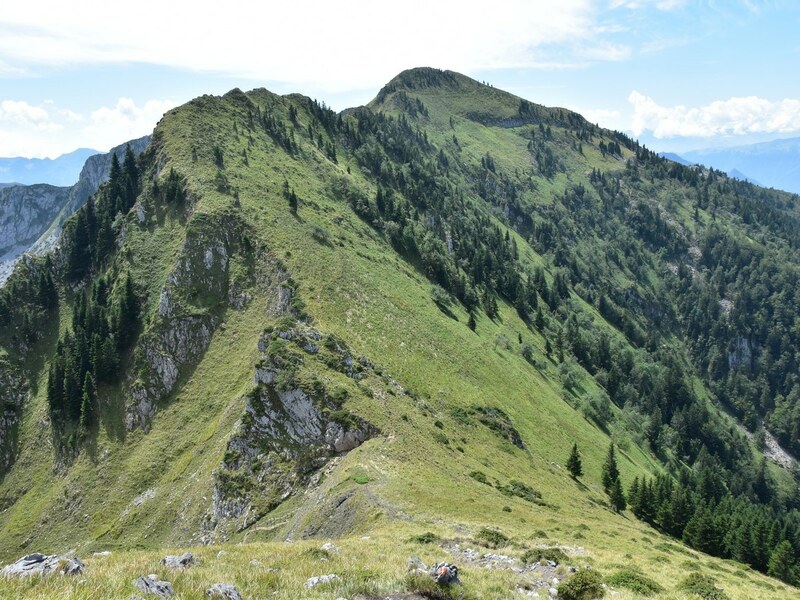 For more views, head up the trail in front of you, which is a short climb to the top of the Pic de l’Escalette (1856m), the fourth summit of the day. This is a great spot to admire vultures and other birds of prey, as well as paragliders sometimes. And the views to the south are still amazing! Drop back to the col and make your way down along the well-trodden trail which heads steeply downhill S towards a sheepfold. As the ground eases, aim at the Cabane de l’Escalette (the building to your left) and pick the trail which heads E behind it, ignoring the main track that runs parallel. The good trail will lead you down gently to the forest, where the going then gets a bit steeper. Just follow the obvious “VTT FFC” orange signs down to the starting point. For a refreshment or an ice-cream after the walk, the Auberge La Soulan is the ideal place as it stands right at the start. It has a great choice of local beers and has delicious meals. This is a good place to stay if you want to do other hikes in the area. If you’re planning a weekend here, we also like to villages of Aspet and St-Béat. Be aware of the basic rules when walking past sheep. 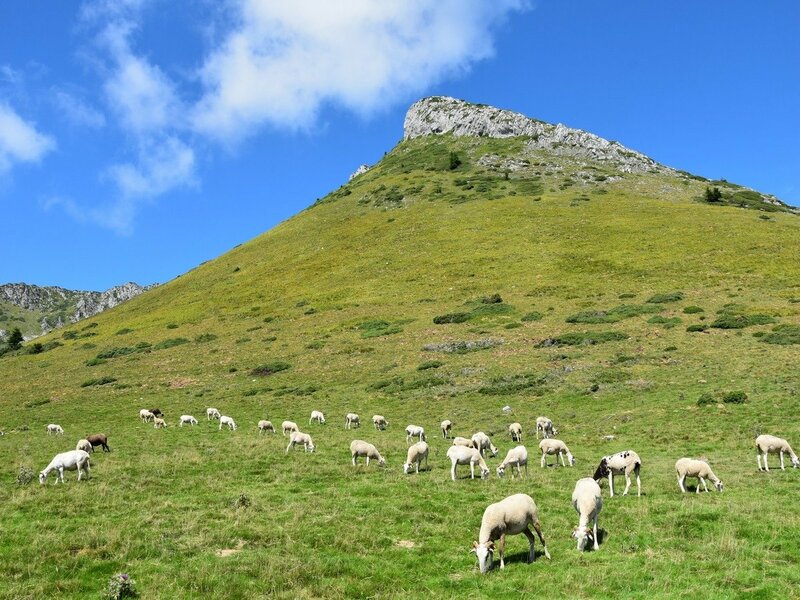 Sheep are usually guarded by a big sheepdog locally called "Pastou" or "Montagne des Pyrénées". These dogs are totally harmless as long as you do not approach the sheep. If you meet a herd, either contour them or silently walk past, staying on the trail/track without stopping nor waving. There is a nice, small campsite in Aspet, called "La Chasse aux Papillons". You can either stay there or just pop in in the evening for a pizza during the high season. Another great hike in the area is the ascent of the Pic du Gar/Pic Saillant (1785m) from the tiny village of Bezins-Garraut, near St-Béat. This is a tough one, with about 1100m climbing, which can be completed either out and back or as a loop walk. Splendid views can be enjoyed from the top. Watch for birds of prey during this walk: red kites and griffon vultures can be observed, as well as alpine choughs. Avoid this ridge walk under windy conditions.